I know some readers will cringe at the thought, but I love the taste of really nutty, grainy bread. A thick slab of that, toasted and smothered in butter, is one of the best breakfasts out there. 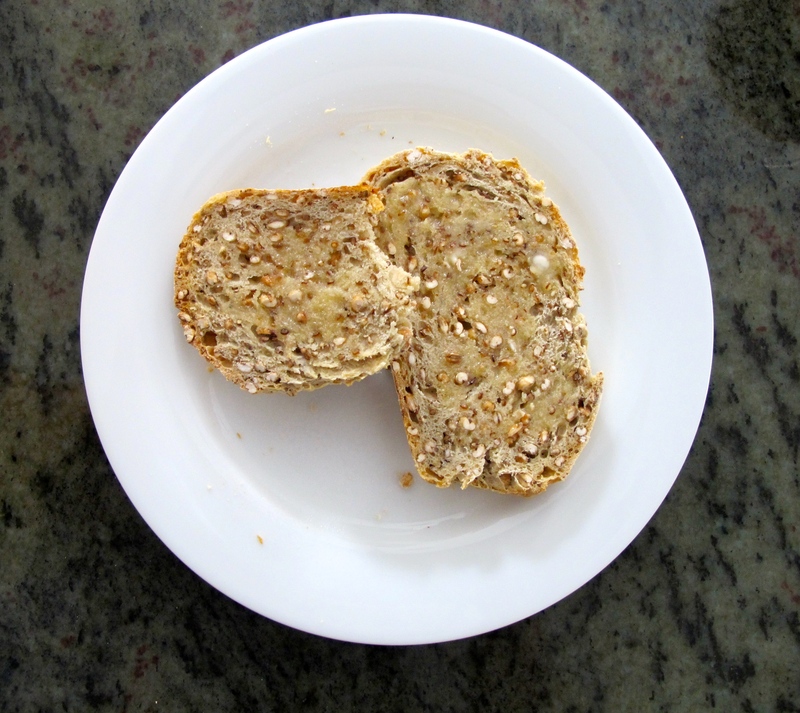 This whole grain bread comes from the blog Girl Versus Dough, and that is an apt way to describe my relationship with this recipe. When I first tried to make it in December, I attempted to make a gluten-free version by subbing the regular flour for buckwheat flour — which ended up in a dough that did not rise at all, and somehow attained this gross concrete color and consistency. Note: swapping flours in a bread recipe does not always yield good results. The next time, I stuck to the original recipe, but found that the bread was not rising well (after the suggested upper limit of three hours, it was only about 150% of its original size). Our house is really cold, so that could have been the issue, or perhaps it was the yeast. Or the buttery grains. Or the soft mattress (props to anyone who got that reference). Either way, I got fed up and baked the dough before it had fully risen. And I was surprised to find that the bread was still pretty good! If you don’t believe me, here is a real life text that I received from my father about it: “The bread you baked was a little dense, but a nice nutty flavor. I liked it! Love, Dad.” So there you go, two people who enjoyed the partially-risen recipe. Don’t sub buckwheat flour for regular flour. If you don’t succeed the first time, try, try again (and maybe don’t veer from the recipe this time). Even if it seems like you failed, you might still find yourself with something delicious in the end. Good luck, and let me know if your version is more successful! Begin by melting the butter in a pan over medium heat. 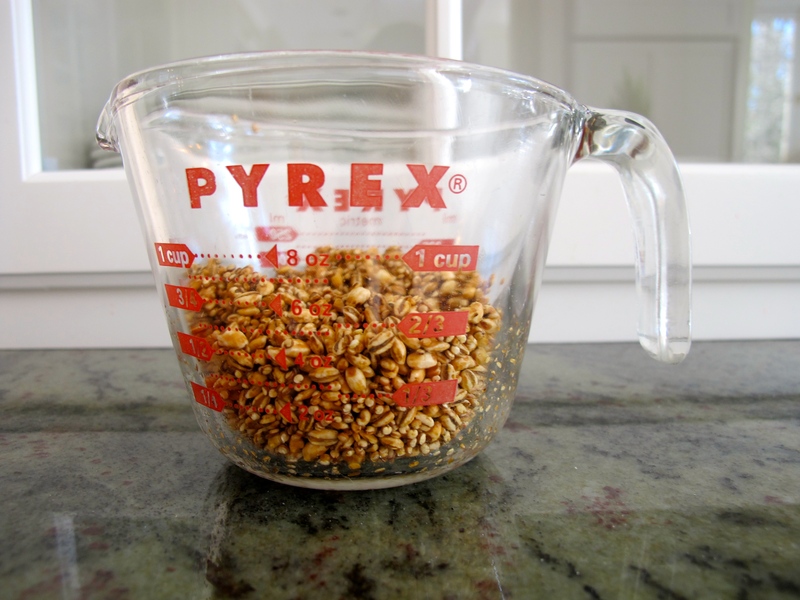 Add in the grains/seeds and cook for 5 to 7 minutes, or until the grains are nice and toasted (and have turned a golden brown shade). Set the grains aside to cool completely; you can make this process go faster by spreading them out on a plate or tray at room temperature, instead of leaving them in the hot pan. Grab a large bowl and stir together the yeast, salt, and warm water. 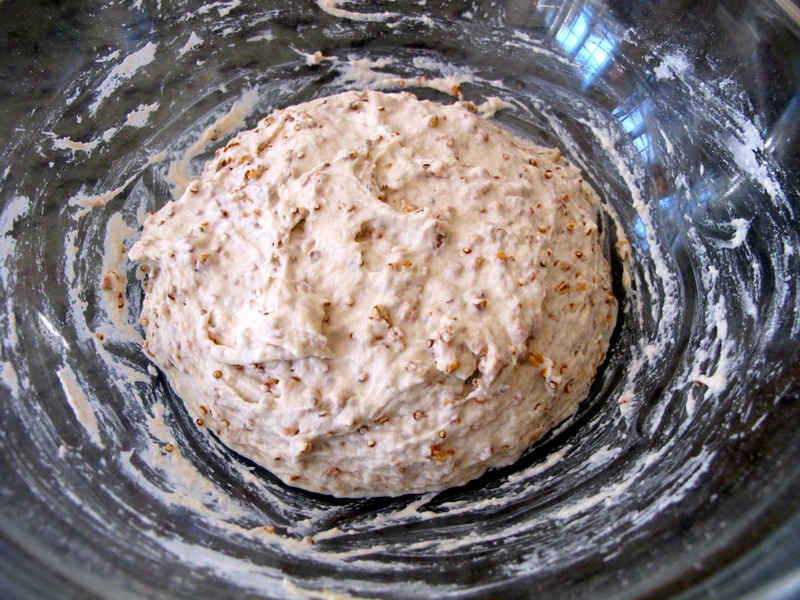 Add in the flour and grains and mix with a wooden spoon until the dough has formed. Cover the bowl with a tea towel and place in a warm, quiet place. Leave it there until it has doubled in size, which should take 2 to 3 hours. After the dough has doubled in size, punch it down in the bowl. Dust some flour onto a dry surface and shape the dough into a nice ball (I did this on a cleaned section of the countertop). Dust a little bit of cornmeal onto a baking sheet and put the dough on there. 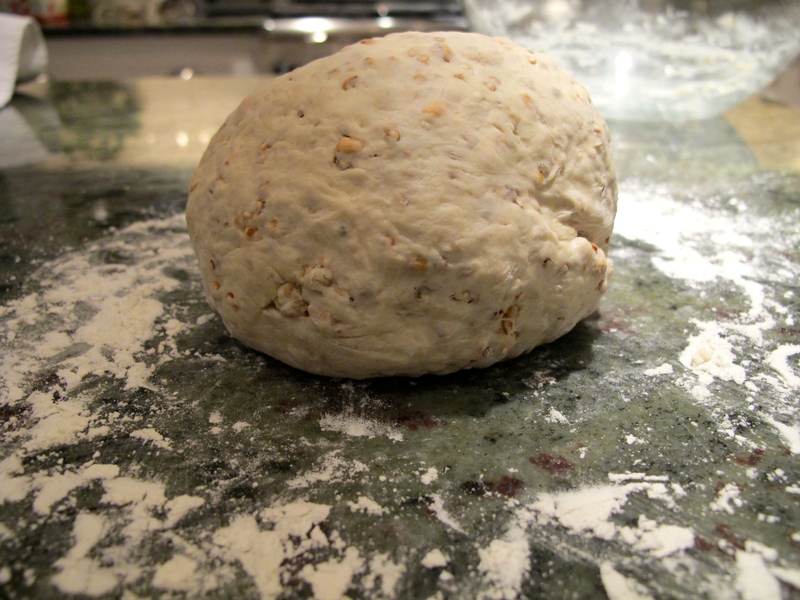 Cover the dough again with a tea towel and let it rise for about an hour until it is lighter. Sprinkle some flour on top, then cut two or three gashes into the top of the loaf (this is called “scoring” the dough). 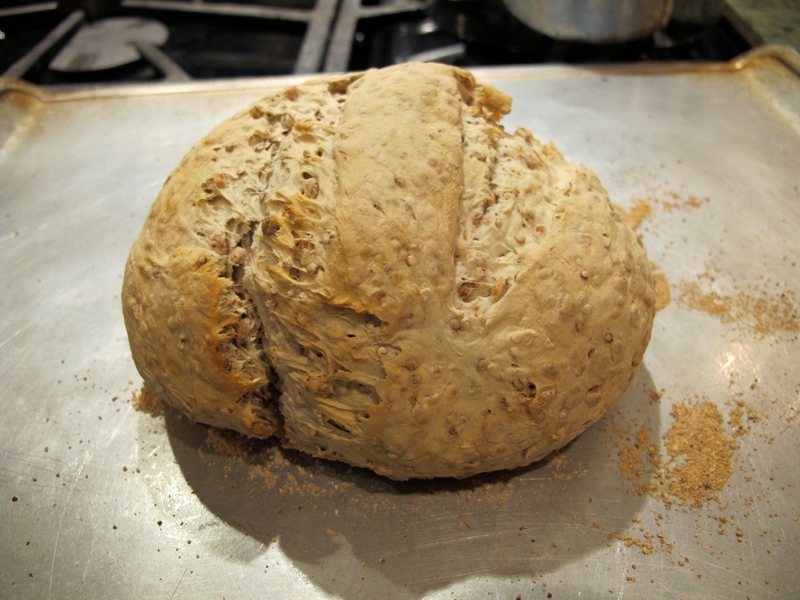 Bake the bread for about half an hour — it will be golden brown when it is done. 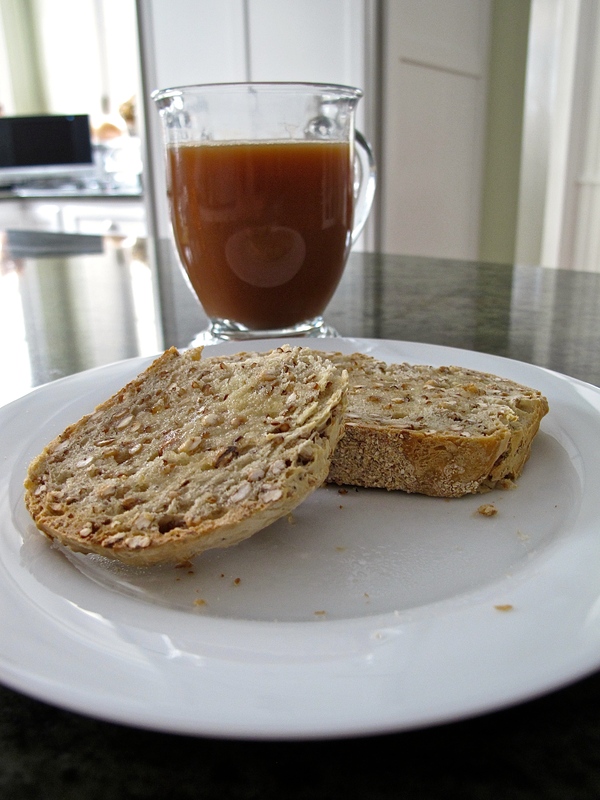 This entry was posted in Noms and tagged Barley, quinoa, whole grain, whole grain bread. Bookmark the permalink. That looks so good, Hollis!! !